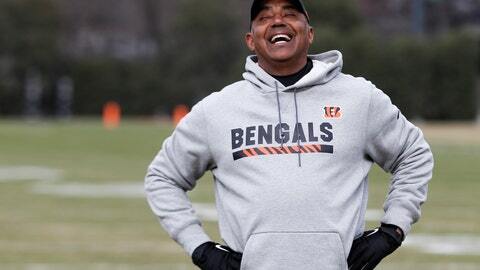 CINCINNATI (AP) — The joy shows on Marvin Lewis’ face. The Bengals coach is back to doing what he loves — running a defense. Can his return to his football roots save his team from another ignominious season? Will the 16th-year head coach get burned out doing two demanding jobs? And can he really make much of a difference on a defense that’s sapped by injuries and depending upon youth? Those questions will start to get answers on Sunday when the Bengals (5-4) play at Baltimore (4-5) , the place where Lewis led one of the NFL’s greatest defenses to a Super Bowl title in the 2000 season. “I’ve got it,” Lewis said, with a reassuring smile. For the second straight season, the Bengals have plunged into a coaching makeover at midstream. They fired offensive coordinator Ken Zampese after an 0-2 start last season. The offense got better, but still finished last in the NFL as the Bengals failed to make the playoffs. This time, it’s the other side of the ball getting a severe makeover in mid-November, with no margin for error in the AFC North. The Bengals need to win Sunday in Baltimore and then at home against Cleveland the following week to keep themselves in playoff position heading into December. Sensing his team is running out of time, Lewis fired defensive coordinator Teryl Austin on Monday and brought back close friend Hue Jackson to help him run the defense. Few try to balance running a defense and coaching a team because of the exhausting workload during the week, let alone the challenges on game day. “Again, there’s a lot,” Lewis acknowledged. For now, the 60-year-old coach seems energized by the role he’s carved out for himself. He enjoyed preparing the week’s defensive plan at home on Monday night, just like old times. Players are curious about how things will change on Sunday. So far, Lewis has tried to focus on basics after players struggled to execute Austin’s defense. He’s also pulled out some plays from previous years and added them to the week’s package. The best defensive coordinators are known for quickly adapting during games and finding ways to blunt whatever an offense throws at them. Nobody knows how Lewis will use the defensive plays differently on Sunday. Lewis’ defense in Baltimore was one of the best of all-time, allowing only 165 points — an NFL record — on its way to the Super Bowl title. The Bengals’ defense is one of the worst of all time , on pace to give up a league record in yards. Cincinnati has allowed at least 500 yards in three straight games, a first in the Super Bowl era, and is coming off a 51-14 loss to the Saints. It’s also severely depleted by injuries. Four linebackers — Vontaze Burfict, Preston Brown, Nick Vigil and Vincent Rey — are dealing with injuries, along with cornerbacks Darqueze Dennard and Dre Kirkpatrick. Jackson sat in the back of the defensive room while Lewis unveiled the defensive game plan on Wednesday with a PowerPoint presentation that included a font so small that some players had trouble reading it on the screen. Instead, the followed along on their iPads. Why didn’t anyone point out the problem? Brown (knee) and Vigil (knee) were among seven players held out of practice in Thursday. Burfict (hip), Rey (groin), Dennard (shoulder) and Kirkpatrick (concussion) were limited. Running back Joe Mixon also was limited with a sore knee. Receiver A.J. Green will miss his second straight game with a toe injury.